Learn About Hearing Loops and How Affordable Audiology Can Help! Hearing aid technology is better than ever before! Today’s hearing aids are smaller, more powerful, and offer wireless and/or Bluetooth connectivity. However, no matter how sophisticated your hearing technology becomes, there will likely be certain listening environments where hearing aids fall short. Churches with high ceilings, lecture halls, auditoriums, or any other listening environment with significant distance between you and the speaker of interest may still be difficult - even with the best hearing technology available. For moments like these, hearing loops are often the answer. Hearing loops (sometimes called “induction loops”) are an assistive listening technology that have become the gold standard for helping people hear better in difficult listening environments. What is a Hearing Loop System? Hearing Loops, along with a pair of well fit hearing aids, can make difficult to hear voices much easier to understand. Hearing aids that are equipped with a T-coil, also known as a telecoil, can allow the user to pick up sound from an installed hearing loop. 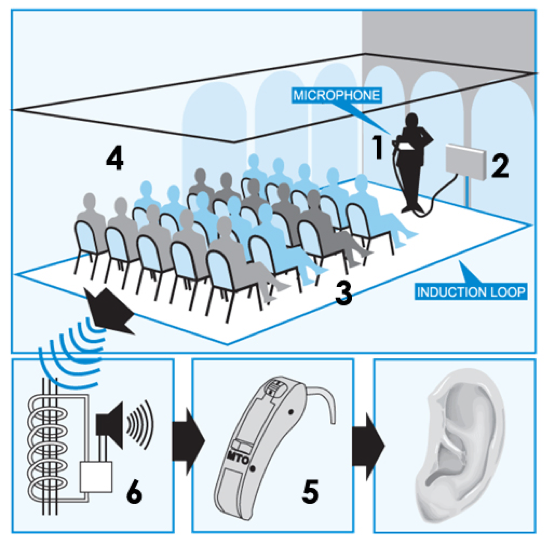 The hearing loop takes the signal from the sound source (frequently a microphone) and sends it directly into the hearing aid via the t-coil. The loop signal then eliminates the background noise in the environment and helps the person hear the looped signal over all the other sounds in the environment. Where Can Hearing Loops Help? The acoustics of many rooms, such as churches, cathedrals, theaters, courts, auditoriums, airports, and train stations make for a challenging listening environment – echoes, reverberation, and background noise are common. Hearing loops are the perfect solution, especially when there is a distance between the sound source and the person. A loop offers a universal connection to any hearing aid with a telecoil, regardless of the brand of hearing aids. A hearing loop shuts out the distractions so that users can hear the sounds they want directly through their hearing aids. How Do I Know if a Church, Business, or Other Building has a Hearing Loop System Installed? This sign is the international symbol that a hearing loop is installed in the area for people with hearing loss. You might see this sign at an airport, a museum, a church, or a movie theater. 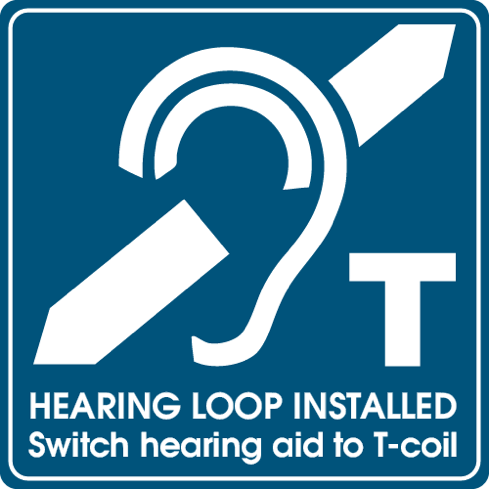 This sign indicates that information is being broadcast through the loop for people to pick up with their hearing technology on the t-coil setting. Many hearing aids sold today have a telecoil installed in them. If you are not sure if your hearing aid has a telecoil, you can ask your provider and find out. 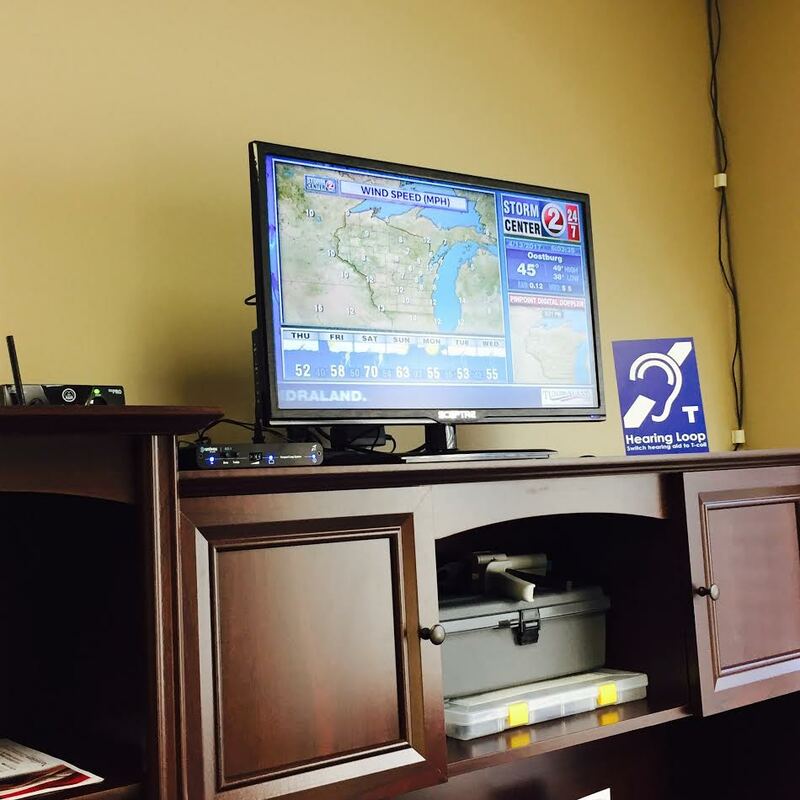 Affordable Audiology is proud to have one of the Oshkosh area’s only hearing loop enabled offices. We can demonstrate how the loop technology works right in our office. Call us to make an appointment to see how this amazing technology can help you hear your best! Hearing Loops, along with a pair of well fit hearing aids, can make difficult to hear voices much easier to understand. Hearing aids that are equipped with a T-coil, also known as a telecoil, can allow the user to pick up sound from an installed hearing loop.